Is the race course long? Not exactly. Here's why you shouldn't always trust the GPS. Is the GPS watch full of it? You cross the finish line, hit your split and look down at your watch. 3.3 miles for 5K, 13.4 for the half marathon…what the what? That course was long, I totally ran faster than my time posted. This perhaps is one of the biggest running misconceptions that frustrates competitors, race directors and races for different reasons. I’m hoping in the this blog to clarify some of the confusion that coincides with GPS watches and “long” race courses. Earlier this spring I ran a 5K on the track while four months pregnant. Those who follow my journey know that the races I ran were all relative to my fitness level and not near actual “race” effort. My plan was to train through my pregnancy, listening to my body along the way and enjoying the days that felt good and cozy on the couch when my body craved it. Some of my Northern Arizona Elite teammates were racing out in California at the Mt. Sac Relays and Azuza Pacific track meet on April 17. I had been feeling good, so I decided to enter the 5K. There were a mix of collegiate women and professional women, with PRs ranging from 15:20-17:30. I knew it would be a good fit for what I thought I could run based on my workouts and watching my heart rate. I set out with the intention of running 85-second laps (5:40 pace) regardless of how the race went out. As a reference I have run 5:40 pace for the full marathon, so that’s where the relative fitness level comes in. If you were in the stands that night, my race looked pretty bizarre and comical I must admit. I ran 85 seconds my first lap, and the field created a decent 30-meter gap ahead of me. “What is that poor pregnant lady doing?” was most likely running through the heads of the fans in the stands. I continued running 85s and slowly began catching runners. Halfway through the race, I had passed five to seven ladies and picked up the pace to a few 84s and 83s. I felt controlled, relaxed and was having a blast. I finished the race in 17:19, averaging just under 85 seconds per lap. I looked down at my watch to stop my time and it read 17:24 for 3.31 miles. A 5K is 3.1, correct? The experiment I wanted to run for this race was wearing my GPS watch on the track, which is a certified 400 meters per lap, so 12.5 laps to a 5K. 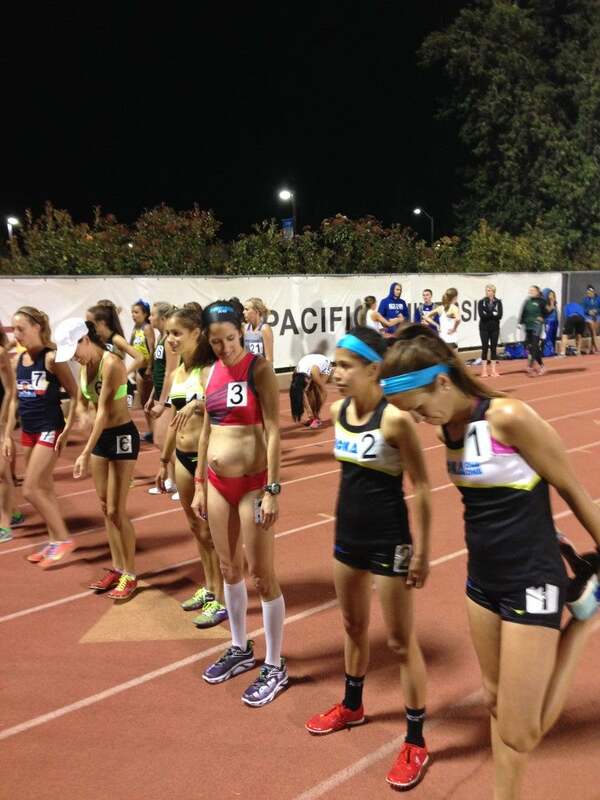 There is no arguing the distance of a 5K on the track. So how come my watch measured the race .21 miles too long? GPS watches receives information from satellites that transmits a signal from thousands of miles away. Your watch locates these signals and pinpoints your position on earth. As you move, the watch continues to receive satellite signals which helps it record where you are. However, mistakes can happen. A GPS watch can error around 10 feet from your current location. So if you run 20 feet in a straight line and it errors on the opposite side of your position both times, it could say you ran 40 feet, or no feet at all. That being said, the GPS will always register earlier than the marks on the track when running around the oval, leading you to believe you ran longer than you do according to your watch. How does this translate to road races? When a road race certifies a course, they measure the shortest tangents, or distance between two points. Throughout a race, it is impossible to run the exact tangents for various reasons. A course with more turns means more tangents to run, so you’re less likely to cover the shortest distance. When certifying a course, a special bike calibration is used and the course is measured multiple times. If the measurements are off even by 10 feet, they will measure the course again. Many certifying officials are very passionate about what they do. They want an accurate course and go through great detail to make sure a course they certify is the full distance. One other thing to note: It maybe also be a touch long as an event may want an exact finish line. The certification done is simply saying the course is at least the advertised distance. Trust the timing systems of most road races you run in, and don’t think they are making you run farther and costing you extra seconds in your final time. Race directors and the people that certify courses put a lot of time and effort into ensuring their routes are measured correctly and you have a positive race experience. It’s not fair to them to finish a race and yell at them claiming their course was long because your GPS read 13.4. I suggest using a 1% rule. If you run a race, give your GPS watch a one percent margin for error. For example a half marathon should equal 13.10 miles, so one percent would be .13 miles. If your watch is in the ballpark of 13.20 to 13.30 miles, the course is probably on point. One last note—not all road races are certified. If they are they will have a certification number usually on file with USATF. If you choose to run a race that is not a certified distance, don’t expect it to be 100% accurate. Certified races often listed that in their event bio or registration page. GPS watches are great tools and help provide us with data on our pace, distance, etc. Take them with a grain of salt and believe in your own ability to manage your effort and trust your sense of pace.